OMEGA’s TT300 cement is a heat-cured, 2-part epoxy adhesive that can be used to bond polyimide-backed strain gauges for strain measurement up to 200°C (392°F). 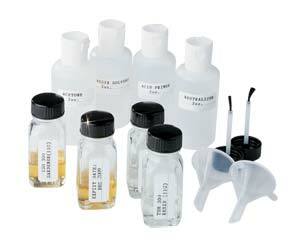 Each TT300 kit includes 2 bottles of resin and hardener that are pre-measured to ensure proper mixing proportions. To use, simply pour one bottle of hardener into one bottle of resin and shake for 1 minute. A bottle each of hardener and resin produce approximately 3/4 oz of adhesive. The shelf life of the resin-hardener mixture is 6 weeks at room temperature. The shelf life of the unmixed components is indefinite, provided that the bottles are kept tightly sealed. Each TT300 kit includes 2 oz of acetone, acid primer, neutralizer, and rosin solvent for cleaning and preparing the surface, as well as 2 funnels and 2 cap brushes. SG496 and SG401 are general purpose cold-curing, 1-part strain gauge glues. They are the most commonly used adhesives for strain gauges. They cure in 1 minute, but require 24 hours to set. SG401 is an ethyl-based cyanoacrylate, and SG496 is a methyl-based cyanoacrylate. They have a 1-year shelf life at room temperature, but shelf life may be longer at colder temperatures. The strain gauge gluetemperature range is -54 to 82°C (-65 to 180°F).